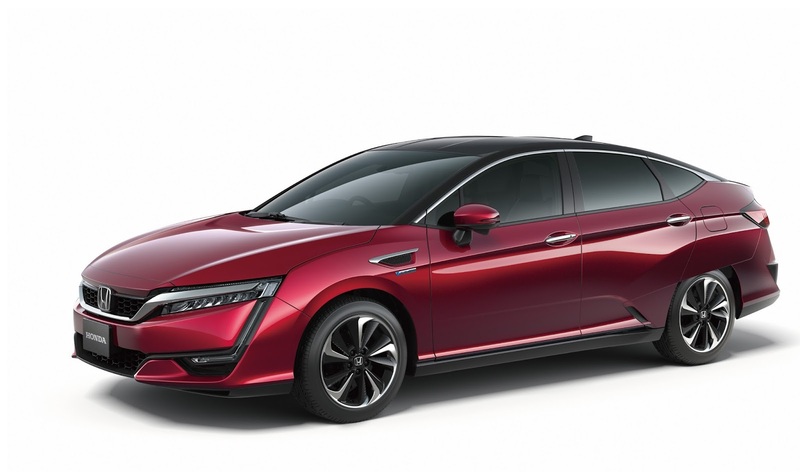 Honda claims its new Clarity Fuel Cell vehicle is the world’s first production hydrogen fuel cell vehicle sedan to house the fuel cell stack and drivetrain system under the bonnet. Incorporating Honda’s design principle of “man maximum, machine minimum”, this unique configuration provides outstanding roominess with seating for five. The size of the fuel cell stack and power generation system is reduced by 33 per cent compared to Honda’s previous hydrogen FCV, the FCX Clarity (below). The fuel cell stack is not only more compact, but it produces a higher output with a maximum fuel cell output of over 100 kW and a fuel cell stack power density of 3.1 kW/litre. Leveraging the high output of the fuel cell stack and the power assist of the lithium-ion battery, the electric motor provides 130kW (177 PS) of output, enabling powerful acceleration and smooth acceleration from standstill to maximum speed. Honda claims it has achieved a best in class fuel cell vehicle range per full tank of over 700 km (435 miles) all with a short refuelling time of around 3 minutes, providing similar day-to-day convenience to that of a traditional gasoline or diesel powered vehicle. The Clarity Fuel Cell, launched at the Tokyo Motor Show, will be available commercially in Japan from early 2016, according to Honda. Further information on the launch of Clarity in Europe will follow in 2016.